Is anything going to happen on September 24th? Well, the astronomers say, no. It is an ordinary day in space, nothing remarkable of note at all on that day by way of asteroid flybys. Yes, it's true, as some news stories say, there is a distant flyby by a rather unremarkable asteroid. It is one of dozens that pass by Earth every month. It's not especially large as asteroids go. Indeed there's one more than double its size, passing closer, at a faster speed, on October 4th that nobody is interested in except perhaps a few astronomers. Then, there's a lunar eclipse on September 28th. Any amateur astronomer has probably watched at least a few of those, and there is nothing remarkable about this one. We don't even know if it will be particularly red - that depends on atmospheric conditions on the day. We've had several predictions of doom reported as news stories so far this year. First, we had an asteroid flyby on April 14th was reported rather sensationally in tabloid newspapers; that got some people worried. Then a bit later this year we got a bunch of news stories about a Dutchman who used Nostradamus to predict a large earthquake in California, again in April, which never happened of course. And, a couple of other minor scares. There is nothing new about this, however, there have been predictions like this, often in clusters, ever since the first century BC. A couple of recent notable ones which many of us will remember were the one in 2012 (end of one of the "long years", or Baktuns in the Mayan calendar), and the year 2000 one (with the year 2000 computer bug scare). So, I thought I'd first take a look at this September 24th story, in a bit more detail. Then, I'll talk a bit about "blood moons" - a term that is new to most astronomers, started to get used in the press around 2010. They generally call these just lunar eclipses. For some reason, not really explained except as "signs", these stories link lunar eclipses with the asteroid flyby. 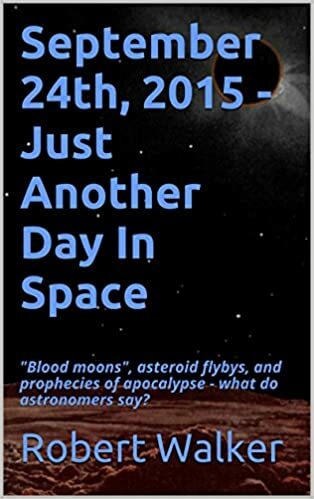 We've had many worried questions on Quora, about the "blood moons" so I'll go into that - it's an interesting topic in its own right, although, for astronomers anyway, it hasn't got much to do with asteroid impacts. I also touch on mini black holes created in CERN, as someone has predicted one of those will swallow up the Earth around now also. Scientists have established that there is no risk of this happening, so I'll explain why they are so confident about this. Then, I'll go a bit into the ideas of Armageddon, and how the "literal Armageddon" is just one of many ways of interpreting the book of Revelation - which was one of the last books added to the Bible and originally considered heretical by early Christians. Then I will talk a bit about scientific ideas about how the world will end, universe also, and some thoughts about how one can deal with the idea that everything we know will some time be gone, though probably hundreds of millions, billions, or if you are talking about the whole observable universe there, trillions of years and more into the future. This is a rather small asteroid of no more than about 270 meters diameter. It's too small to have global effects on the Earth anyway (needs to be 1 - 10 km for that). It could indeed devastate a city or cause a tsunami. But it's due to miss us by over 21 times the distance to the Moon. There are many near misses every month, for instance, right now there are 36 near misses predicted for October 2015. The one on 4th October, 2015 FS332, 580 meters to 1.3 km in diameter, passes within 18.6 lunar distances. It is far larger than the one on the 24th of September, more than twice the size, and comes a little closer. It's faster also, relative to Earth (21.15 instead of 19.5 kilometers per second). Yet there are no prophecies or news stories about that one. And, if you look at the tables, just about any month you'll see a few meteorites similar in size and distance to 2012 TT5, try the NEO Close Approach Tables - updated every day. For more about the September 24 "prediction" from an astronomical perspective, see The Truth About the “September 2015 Asteroid Impact” by Colin Johnston, Science Education Director at Amargh Planetarium, Ireland. For another example, in January a larger asteroid about 500 meters across passed far closer than this to the Earth, at a distance of 1.2 million kilometers, or a little over three times the distance to the Moon. This makes it more than one and a half times larger than 2012 TT5, and it flew past Earth at a seventh of its distance of 2012 TT5. But this didn't lead to any Armageddon predictions at all as far as I know. Mountain-Size Asteroid to Fly by Earth Monday: How NASA Will Watch - artist's impression. Then, on May 15th, for some reason, a one kilometer asteroid passing at 26 times the distance to the Moon hit the headlines in the tabloid newspapers, with headlines like: "Asteroid a MILE wide to hurtle past Earth in 48 HOURS - as experts warn of MASS EXTINCTION" - A COLOSSAL asteroid hurtling through space is feared to be one of the biggest EVER to threaten a collision with Earth." "An asteroid, designated 1999 FN53, will safely pass more than 26 times the distance of Earth to the moon on May 14. To put it another way, at its closest point, the asteroid will get no closer than 6.3 million miles away (10 million kilometers). It will not get closer than that for well over 100 years. And even then, (119 years from now) it will be so far away it will not affect our planet in any way, shape or form. 1999 FN53 is approximately 3,000 feet (1 kilometer) across." Yes, that May 15th asteroid was quite large as asteroids go, but not colossal. It would be a bad day if an asteroid like that hit Earth, for sure, devastate an entire country, and have some global effects. But it didn't come particularly close, and is one of numerous asteroids that fly past Earth every month. Asteroids can't suddenly swerve out of their orbits, so it makes no difference if it misses us by say 5 times the distance of the Moon or 20 times, or even passes closer to Earth than the Moon - it is still a miss. It does remind us of the need to track these asteroids. But it has no significance for that particular asteroid. If it misses, it misses and that's all there is to it. Getting scared by these misses is a bit like walking along the pavement and panicking every time a car or bus on the road misses you by a couple of meters. Do pedestrians get scared because a bus is about to miss them by a couple of meters? A bus can go out of control, though it is exceedingly rare. Asteroids can't swerve into a new orbit and hit the Earth. Like pedestrians on a busy street, Earth gets close flybys by thousands of different asteroids, but all of the ones found so far are in orbits that won't hit Earth in the next century, and most of them, probably, not for millions of years. The picture, by the way, is of the first hydrogen fuel cell London bus, photo taken in 2011. From these examples, from an astronomical point of view, it all seems rather random, whether people get worked up about an asteroid flyby or just ignore it and leave it to the astronomers. At any rate, there's no need to be concerned about the 24th September meteorite. As for asteroids more generally, well for the big ones like the ones in Armageddon movie - forget about it. There's been nothing like that for over three billion years in the entire inner solar system. The reason seems to be that we get protected by Jupiter, which catches most of them, or flings them to the sun or out of the solar system, or breaks them up into smaller 1-10 km sized chunks. Dinosaur era ending ones do occur, yes, but they are far less likely than you would think. Want to guess how likely a Dinosaur era ending impact is in the next century? If you don't know the answer, and are going by the movies, I can pretty much guarantee you'll over estimate. 1 chance in a thousand? 1 chance in ten thousand? 1 chance in a hundred thousand? 1 chance in a million? Less than one chance in a million? None of those - if so what is your guess? And what do you think is a "best guess" for how long it is likely to be before we get hit by one? Answer below, giving some space so you can pause and guess, scroll down to see the answer. The answer is, there is less than one chance in a million. It was one chance in a million before they started the search. But now we know all the ten kilometer asteroids right out through the main asteroid belt. That leaves only 10% of them left to find (estimated). So (since there isn't any selection bias to make the ones due to hit us harder to find), that makes the chance more like one in ten million that there's an undiscovered asteroid due to hit us in the next century. Also, there are plans in place to make sure that by the 2020s we will have plotted nearly all of the ones of that size, and smaller ones also down to one kilometer in diameter, right out to the outer solar system. Asteroids of around ten kilometers in diameter hit Earth roughly every 100 million years, so a "best guess" would be that it's at least several million years before we are hit by one. The best way we can deal with the asteroid threats is to step up detection of asteroids. And indeed, teams of astronomers, amateur and professional, are working on just this. Sensitive wide field telescopes look for them every night in automatic searches. For instance, Pan-STARRS takes 1.4 gigapixel photos several times a minute, spanning three degrees of sky (six times the diameter of the Moon), looking for new faint asteroids. Then, the B612 foundation plans a space telescope in orbit close to Venus to look outwards and search for the ones hard to see from Earth. This is the only known way to make a complete survey of the smaller 100 meter sized ones that orbit inside of Earth, which may hit us from the direction of the sun. Eventually, if we can get space based mirrors like that in place, we'll know nearly all of them from 30 meters upwards, probably within a decade or two. Then other teams are busy working out the trajectories from the observations. We already know nearly all the asteroid from 1 km upwards likely to be a threat - none of the ones discovered so far are. And if we find one headed our way - then most likely we have many years, decades, or centuries of warning, and we have already devised many ways to deflect them. With plenty of warning, a gentle shove, to change its velocity by a millionth of a meter per second, may be all that is needed. That's for the case where you apply it a decade or two before the projected hit, and if it does a flyby of Earth in between (as is usually the case). Or in the worst case, evacuate the region it is headed for or go into shelters. Or for the smaller ones, keep indoors and away from windows at the moment of impact and evacuate the place it's going to hit. We should spot a ten kilometer diameter asteroid probably a couple of decades before it hits us, in the remote one in a ten million chance they find one headed our way. Pan-STARRS is the only survey still finding them - it is sensitive enough to spot an asteroid 300 meters across out to the outer asteroid belt. It's finding one asteroid a month of one kilometer or larger. So, that part of the search is well underway and should be pretty much complete by the 2020s. There are many methods now known that could deflect asteroids, especially with such long lead times before the impact. Even sometimes just paint it white and that will do the trick. But first we need to detect them. This is the launch of the asteroid day campaign last year, with Brian May talking about the effect of a 100 meter asteroid if it hit London. It has never happened in recorded history. Much of Earth is ocean, desert, But asteroids this big hit Earth roughly every 50 years, and with our growing population, it's getting more likely that they could hit a big city. It's probably what we should focus most on now, given that the one kilometer and larger search is well underway and will be completed by the 2020s pretty much. The moon always goes red during lunar eclipse. It's rather poetic actually. Our Moon goes red from the light of all the combined sunsets and dawns on the world at the time of the eclipse. At the time of eclipse, the Sun and Moon line up so that the red light shines on the Moon. The ISS gets sixteen sunrises and sunsets every day for much of the year - if you like to watch them, a low Earth orbit is the place to be, every 45 minutes you'll see one or the other of them (though there are times of year when it is permanently in sunlight and you don't see them, around the summer solstice). This is the light which turns an eclipsed moon red, as seen from the space station. As seen from the Moon the Earth would look dark with a very fine red ring all the way around it because of all the light from the sunsets and sunrises. And a short video by JAXA - not actually from the Moon but from lunar orbit. We also have a short video of the sun going behind the Earth, as seen by the Apollo 12 crew, Conrad, Gordon and Bean, on their journey back to Earth from the Moon. (click to show on youtube, this frame is 18 seconds into the video). And Hana Gartstein, graphic artist from Israel, did a nice simulation of it here, adapting a photo of Earth taken on the Apollo 17 mission. This would make the landscape go red in colour. This painting of the Earth as seen from the Moon during an eclipse is by Lucien Rudaux, space artist, living in first half of the twentieth century. And here is a video simulation of a lunar eclipse from the Moon, by Ernie Wright, for NASA. "In the early morning hours of April 15, 2014, the Moon enters the Earth’s shadow, creating a total lunar eclipse. When viewed from the Moon, as in this animation, the Earth hides the Sun. A red ring, the sum of all Earth’s sunrises and sunsets, lines the Earth’s limb and casts a ruddy light on the lunar landscape. With the darkness of the eclipse, the stars come out. "The city lights of North and South America are visible on the night side of the Earth. The part of the Earth visible in this animation is the part where the lunar eclipse can be seen." Lunar eclipse of 15th April 2014, seen from the Moon. Nothing at all to do with blood. And this happens during every lunar eclipse. The colour of the Moon varies, depending on the weather conditions on the Earth, so we can't say for sure, what colour it will be. For some reason recently people have taken to calling a set of four lunar eclipses a blood Moon. But it's got no historical precedence. Just a new term that people have started to use recently. It's so sad really, that the lunar eclipse, which is normally a matter of wonder, for amateur astronomers, has been reinterpreted in this way as a sign of an approaching apocalypse. And - there's no possible causal connection there. A lunar eclipse just arises when the Moon passes through the shadow of the Earth (something the ISS does 16 times a day). One of the predictions, apparently, is that on the 23rd of September, 2015, the LHC will create a mini black hole and that Earth will be whisked through a portal to the "Abyss". Or others say, a mini black hole will swallow first France, then the entire Earth in seconds, and then soon after, the entire solar system. I don't want to add to their credibility in google with a link, but they are easy to find with a google search. It's not the first time someone has prophesied something like this. When CERN was first turned on, there was a similar worry amongst many that the Earth would get swallowed up by a mini black hole. It is true indeed that the LHC (Large Hadron Collider), operated by CERN, could create mini black holes according to some theories. Those sound alarming if you don't know the background. The risk was credible enough, that a detailed safety review was done. But the thing is that CERN is reproducing collisions that happen naturally in the upper atmosphere - indeed at energies we can't reach on the Earth. The LHC with its reboot can now reach 13 TeV. The highest energy cosmic radiation protons reach energies of around a hundred million TeV. Those particles reach Earth at a rate of one per square kilometer per century. Which means that the Earth is hit by about five million of them every year. They'd dearly love to find out more about the highest energy collisions. But a collision at a hundred million TeV in the upper atmosphere produces around a billion particles in the debris, and you only catch a few of them. There's not much chance of us ever getting a detailed close up view of those. So - they do continue to study the high energy ones indirectly like that. It's the only way we have to find out anything about them at all. But for the lower energy ones, they reproduce those conditions on the ground in such a way that they can arrange for the collisions to happen next to the detectors, which are the size of a multi-story house and have to be very close to the collision to detect things that are short lived, soon vanish as they fly away from the collision. One of the huge detectors in the LHC. There's not much chance of studying cosmic radiation with detectors like this, which need to be positioned right next to the collision. That's why they create the collisions in the LHC even though far higher energy ones occur naturally in the atmosphere. The mini black holes, if they do form at energies produced by the LHC, are also created in these natural cosmic ray collisions. So they can't be hazardous to the Earth as we are still here. Whatever they do, they do that every year anyway, and at such low energies, that means we must have billions of them forming in the Earth atmosphere every year and we don't get whisked through a portal every year. So I think nothing to worry about there either. If it was just based on physics and theories, then there is a reasonable case that they are harmless because of Hawking Radiation which it's thought would mean they would evaporate immediately in a tiny fraction of a second. But that's only theoretical, not yet observed because of difficulties of creating them in a laboratory, if they exist at all. Indeed that is one of the predictions the experiment could confirm. So - that wouldn't be enough to prove that it is safe. The reason scientists are sure it is safe is rather because they are only reproducing conditions that happen naturally, indeed at far higher energies which the LHC could never achieve, nor any other accelerator we can build. The most energetic "cosmic rays" are produced in natural "accelerators" around stars, and the most energetic ones are too energetic to be produced even with a stellar sized accelerator. Perhaps they are produced by black holes in galactic nuclei? The first of these to be discovered packed as much energy as a baseball thrown at 60 mph. That may not sound a lot, but for a tiny particle the size of a proton, that's an absolutely huge, almost unbelievable, amount of energy. The glorious Crab Nebula in the constellation Taurus, above the head of Orion - photographed with Hubble. You can get the full size original here. 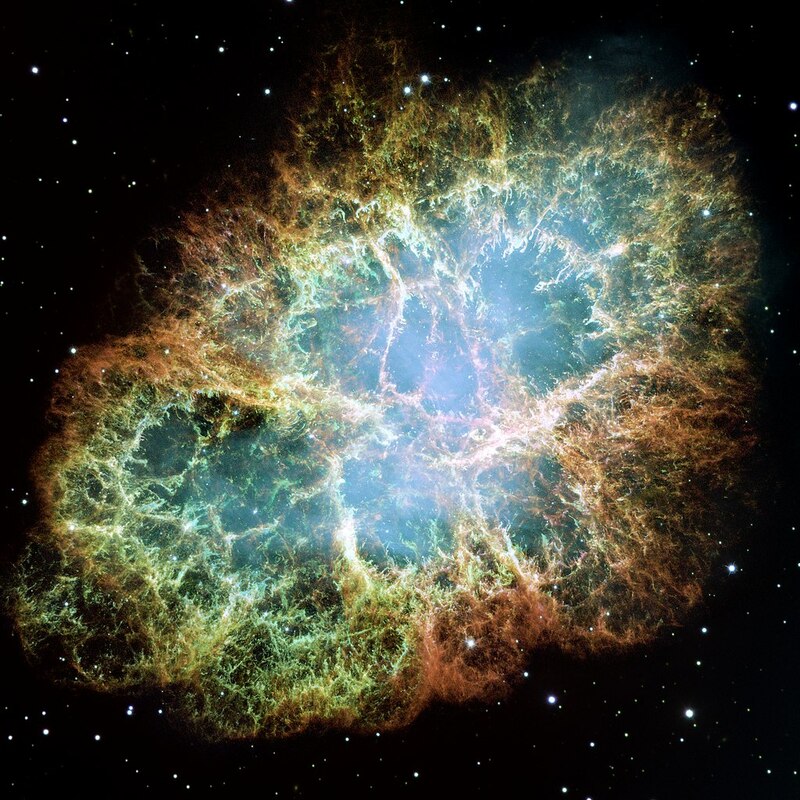 Zoom in on the Hubble detailed image of the crab nebula, shown in context in the night sky above Orion (ESA animation). It's a natural huge "particle accelerator, producing particles with energies way beyond current human capabilities. But even this accelerator is nowhere near powerful enough to create the most powerful cosmic rays, protons flying so quickly relative to Earth that they pack as much energy as a baseball thrown at 60 mph, or faster. Their source is currently unknown, possibly giant black holes. With our technology, we'd need to build similarly sized accelerators to equal those energy levels. We are nowhere near to that capability yet. We can't even bid an accelerator with the diameter of our Earth - and such an accelerator would be nowhere near large enough to equal the power of these natural accelerators. And at present, we don't have any other method to create particles with such huge amounts of energy, or anything close to this. For more on this, see The Astronomical Particle Colliders That Put Our Own to Shame, Cosmic radiation (CERN), The Safety of the LHC, and Ultra high energy cosmic radiation (wikipedia) ). Would you go to the bible and to prophets for advice about when to launch a spacecraft, and in what direction and at what speed to send it to Pluto? The Bible has many good points to it, you can go to it for advice and help, about how to lead your life. But astronomy is hardly its focus, and there aren't any particularly accurate predictions from that era, in astronomy - except for lunar and solar eclipses which have regular patterns to them. So why expect to be able to use it to predict the dynamics of our solar system? So far the success rate of prophets relying on the Bible to predict any recent cosmic events is zero as far as I know. Many of the predictions of asteroid impacts that hit the news are based on prophecies which the authors think are validated by the Bible, particularly, the book of Revelation. So, I thought, might be nice to talk a bit about this also. I'm writing this as a Buddhist answering a Christian question, but I've got a reasonable background in Christianity / theology as well. My parents were both ordained as ministers in a Scottish church that permitted women ministers already back in the 1950s. Though they were teachers when I was growing up, they were both missionaries originally. I grew up surrounded by shelves and shelves of books on theology belonging to my father who had a special interest in theology and taught religious education at school. I read lots of theology as a child out of interest. I'm not in any way a theologian, of course. But perhaps I have enough background, with feet in several worlds at once - Buddhist, Christian, Scientific - Philosophy also - to suggest a few pointers towards other ways of looking at such questions. I felt it might be interesting to show that there are other perspectives on it. Please don't expect too much from this. The idea is not to try to write about Christian theology - you can follow up the citation to find out about that. The idea is just to share a few thoughts that may point to new directions, and perhaps give an interesting new light on it if you, for instance, come from a fundamentalist background, and haven't come across these other ways of thinking about the Bible and especially, of the book of Revelation. So, first, the Bible is only one of many holy scriptures in the world. The Hindus have their scriptures too for instance which they regard as highly as Christians regard theirs.And there are many other traditions about what happens in the future. For instance, as an example of another tradition, many Buddhists believe that the historical Buddha is the fourth of a series of a thousand Buddhas that arise from time to time, their teachings last for a few thousand years, then fade away and eventually after many thousands of years new teachings arise again. With us, these aren't thought of as "revealed truth" but just a kind of tradition, you don't have to accept it as true to be a Buddhist. There are no "revealed truths" in that sense in Buddhism. The idea is that we are encouraged to think through everything for ourselves and question anything. So in those traditions, there are 996 Buddhas still to come in our world system, so we have got a fair while yet before the world will end. In these traditions also, this particular world system with its 1000 Buddhas is a part of larger and larger cycles ending with destruction indeed, and renewals, because nothing is permanent. But that's in the far distant future,maybe millions of years into the future. This is not a creed, not in Buddhism, but many Buddhists think this way just because that's how they were brought up (the numbers like 4 and 996 here vary depending on the tradition). So, if you are brought up a Hindu or a Buddhist - or indeed in many other religious traditions, you don't have anything corresponding to the idea of an impending apocalypse. The idea simply isn't there. But within the Christian traditions also, many Christians don't interpret the book of Revelation this way. Let's just take a short look at it. "A view that Revelation must be understood in the context of its own time and the events symbolized in its pages as having already taken place.
" A view that only a portion of the revelations have occurred and that the work offers clues to the remaining portion of human history. "A view that the book is best understood spiritually, and no attempt should be made to interpret it in the context of history.
" A view that the book is prophetic and its prophecies are yet to be completely fulfilled."" The idea of a literal Armageddon is the fourth of those common ways of interpreting the Bible. The book of Revelation was added to the Bible at quite a late date. It was originally regarded as heretical by some of the early Christians. "Regardless of whether Revelation holds the secret of the time and place that history as we know it will end, it holds the view that how one lives matters greatly. That alone makes it of value for those who use it as an authority for their lives. "Its vision may have been intended primarily to support Christians facing death for their first century faith, but it has served a much broader purpose for continuing Christianity. A book of comfort and devotion, it has called people to faithfulness over the years, while assuring them of the faithfulness of the God it proclaims." So, it seems it is intended primarily as a message of hope, to Christians who are already in trouble. That's why the view 1, that the events described in the book of Revelation have already taken place is also a reasonable view to take, Or indeed the view 3, that it is best understood spiritually. In both cases it has no future predictive power since it either describes events of the first century AD, or it is meant to be taken spiritually, as a message of hope, with no intention of prophecy of actual events in the world. Many Christians do take it in those ways. Teachings like this are surely meant to inspire us to look at our lives and treat them as more precious and of greater value and inspire us to live better and more meaningful lives. If you end up getting scared and upset - for no reason, especially repeatedly, for one predicted but failed Armageddon after another - I'm sure that can't be Jesus or God's message. Whatever it means, that can't be its central message. HOW COULD THEY PREDICT METEORITE STRIKES, WHEN NOBODY KNEW WHERE METEORITES CAME FROM? There are many failed predictions going right back to the time the book of Revelation was written. See this list of predictions of the end of the world. Also this list of 242 predictions of the end of the world. At the time of the Bible, nobody knew that giant asteroids existed. They knew about meteorites, but nobody knew where meteorites came from. Ideas for their origins included strong winds, thunderstorms and volcanoes. But nobody seems to have come up with the idea that perhaps they came from outer space. The first suggestion that meteorites came from space didn't come until the late eighteenth century, when Ernst Friedrick Chladu published his theory in 1794 "On the origin of the Mass of Iron Discovered by Pallas and Others Similar to It, and on Some Natural Phenomena Related to Them". That was just before the discovery of Ceres in 1801 which was the first asteroid ever discovered. Found by Guissepe Piazzi. 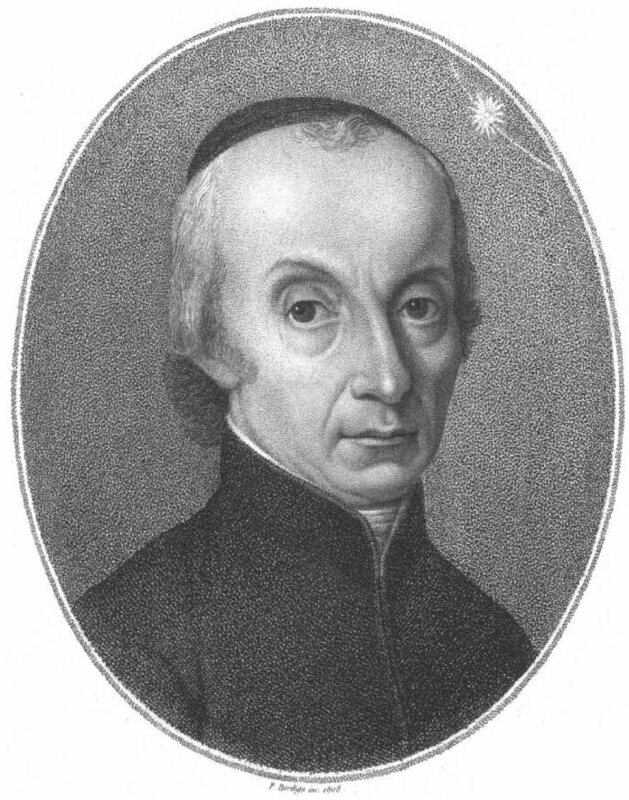 Portrait of Guiseppe Piazzi who discovered Ceres in 1801 - at that time thought of as a new planet, later they found out it was the largest of many objects in the asteroid belt. Details of his life, and the discovery here. After spotting Ceres, he promptly lost it again, not having enough observations to predict its next appearance as it disappeared behind the sun. But the great mathematician Gauss saved the day by coming up with a way to predict the motion of an asteroid from as few as three accurate observations. Portrait of Carl Friedrich Gauss - the famous German mathematician, often regarded as one of the greatest mathematicians of all time, who saved the day by devising a way of predicting an asteroids motion using just three observations. There is no way that the author of the book of Revelation could know that Ceres existed. Flyover of Ceres made from images taken by the Dawn spacecraft in its first mapping orbit. So, there is no way the Bible could predict the motions of asteroids, even the very largest ones. You can't predict something you don't know is there. While on the other hand the methods of astronomy and science lead to accurate and successful predictions of many astronomical events each year. Predicted often accurately to the minute and even the second. This circulated on Facebook recently as a kind of spoof of all these doomsday scenarios. Yes, the idea that there will be a literal Armageddon is a respectable view which some Christians hold as a matter of belief (one of many). However, I think there is no reason, even if you hold that belief to think it is particularly any more likely to happen now than it was in the century after Jesus died, when it was first predicted to happen. Not when you have that perspective of those 242 failed predictions of the end of the world. That list doesn't include several new ones predicted since 2012, which didn't happen, with several failed predictions this year already. So I think we can confidently expect to get many more predictions like that, most years, for the foreseeable future. Perhaps it helps to have a bit of perspective to realize that for many other traditions, such ideas have no hold on their minds at all. If you were brought up as a Hindu or Jain or Buddhist or Taoist or Shintoist or in a Shamanistic tradition or with Ancestor worship etc etc then these ideas would mean nothing to you. And to realize also that if you were brought up as a Christian in a different tradition of Christianity, again the ideas would have no hold on you, because you'd think of it as written for the first century Early Christians, with the events either something that already happened for them, or of spiritual meaning. As to why the world would end eventually - I think that it will become uninhabitable about 500 million years from now, unless we find a way to do something about it, as the sun heats up on the way to becoming a red giant. And if we find a way past that - well won't be us anyway probably evolved into something else long before or extinct and new species and civilizations arise. But if so - well eventually something will happen eventually. End of the universe perhaps. Or just that parts of it become uninhabitable. Either way nothing lasts forever. But that doesn't make the universe and our Earth any less precious. COULD A WAY BE FOUND TO CONTINUE PAST THE END OF THE UNIVERSE TRILLIONS OF YEARS FROM NOW? It could be that some way is found. If we can warp space at will and create new universes as some suggest is possible. Or perhaps not, it all turns into light eventually either through black holes evaporating or if protons decay as some think is possible. It's a bit like, if you lived in early Paleolithic times - you'd have a whole world you lived in - and all that's left now are a few cave paintings of that entire 2.6 million years of history over the entire world. In many places nothing is left except a few piles of shells, or nothing at all. Very probably at some time in the future long before the end of the universe, there won't be much left of the C20 on Earth and even the most specialist historians will have forgotten it. Like - you can imagine some future historians of another species say a billion years from now trying to figure out who, or even what species, left the foot prints and lunar modules on the Moon - if they still exist and haven't been removed by then. They won't be humans anyway - well very unlikely, billions of years into the future. And then trillions of years into the future, others may visit our sun, by then a white dwarf star slowly cooling down - and there might be no sign at all that intelligent species once lived there in the past. There may be new "universes" that form after that, with other creatures in them - I'm not sure it makes much difference myself if some race from this universe is able to colonize another universe or they evolve again from scratch there. Freeman Dyson did figure out another possible way, by which intelligent creatures could last subjectively for every in an ever expanding cooling universe, if it has an infinite future. It might be of interest. "In conclusion, I would like to emphasize that I have not given any definitive proof of my statement that communication of an infinite quantity of information at a finite cost in energy is possible. To give a definitive proof, I would have to design in detail a transmitter and a receiver and demonstrate that they can do what I claim. I have not even tried to design the hardware for my communications system. All I have done is to show that a system performing according to my specifications is not in obvious contradiction with the known laws of physics and information theory. The universe that I have explored in a preliminary way in these lectures is very different from the universe which Steven Weinberg had in mind when he said, "The more the universe seems comprehensible, the more it also seems pointless." I have found a universe growing without limit in richness and complexity, a universe of life surviving forever and making itself known to its neighbors across unimaginable gulfs of space and time. Is Weinberg's universe or mine closer to the truth? One day, before long, we should know." IF THE WORLD DOES END EVENTUALLY - DOES THAT MATTER SO MUCH? If you are Christian, following the ideas of the early Christians about the end of the world, then this is a time of great hope and promise. So if you are a devout Christian and think that way, it shouldn't be a scary thing, at least according to the original message of the book of Revelation. But for most of us, we may find it hard to relate to the idea that the world will come to an end eventually, even if it is billions of years from now. So, just to say a bit about that, sharing a few thoughts that may help, coming from another perspective. So, first, forgetting is part of life. I can't remember everything that happened today even. Just a few highlights. Try going through your day and see if you can remember 16 hours worth of details. And now, at age 61, when I remember things 40 or more years ago, I'd be lucky to remember more than a few things per year - and most often, will not remember exactly which year it was. So it is sort of like that. Eventually, in the distant future, our world surely also will be forgotten. I think it's partly a cultural thing, to do with the way we are brought up. In other cultures we'd be more used to things getting forgotten and passing away. Nowadays we have so many tools we now have to trace out our histories - birth and death records, archaeological research, carefully researched histories based on mountains of documents accumulated in the past. In earlier civilizations, and indeed in some cultures to this day -, all you'd have are a few vague and probably embellished tales told by your parents and others in your tribe about ancestors that lived centuries earlier. Imagine if the modern record keeping had gone on for millions of years, so we knew every detail of every life of every human back 2.6 million years? That writing was invented right at the start, and every human that ever lived had kept a record of their life, scratched into cave walls, or whatever. Piled up scratched rocks, bones, parchments, to fill their caves to bursting, then building monuments to hold all the records, etc etc, every day of everyone's lives for 2.6 million years? It would be a great boon to historians, but - it would also be rather overwhelming. And probably most people would just not be much interested in it. If we did get totally caught up in the past, how would we be able to live our present lives? But - something surely goes on into the future indefinitely. Not our memories, they fade eventually, but there is a continuity into the future. I myself am Buddhist and I think it is likely that we are reborn over and over in other lives as other beings, so there's some continuity going forward like that. Not the same person, not the same likes, interests, not going to look like me, quite possibly other creatures not human, including animals - or ETs if they exist. A continuity of awareness, from one to the other into the future. But whether or not, whatever your ideas about what happens when you die, there's also just the universe continuing, past things leading to future, there'd be some connection between the past and future. Even if it all turns into light and then the light collapses to make a new universe (as in Roger Penrose's conformal cyclic cosmology idea). The past wouldn't be erased by that, some connection would go through to the new universe. Maybe even the past itself in some way could be accessible. Maybe we are not as distant from the past as we think, maybe there is some interconnection with it right in the present. But if it continues infinitely into future without ending, it probably also continues infinitely into past. Or at least for a good many universe lifetimes into past and future. How likely is it we'd be in the first universe, even if there was a first one? Then, of course what we do matters. Why should what we are to future beings who live thousands of years from now be more important than what we are to the people around us just now? This seems a terribly skewed up way of looking at things, to be continually thinking about trying to leave a legacy for the future. I mean our society kind of drums it into us over and over - what is my legacy going to be - what will I be to people in the distant future etc etc? So, of course we think about this, naturally, because it's a prevalent thing in our society. But you can come to look at things a bit differently. To value the present as it is, in the present. And value whatever you can do for the future, for what it can do for them, in the future, rather than for what it can do to preserve the present. Then that can lead to seeing the value of this life. That right now you can reflect on things, can listen to others, look at your own situation, help others. When you look at death in the future - well we don't know what is next. But in this life we can use it well. And then, to think of death as like a great adventure. We don't know what will happen next. Everything we know is gone. But what is to come? It can be scary, or awe inspiring, or something of wonder. But opening out to it, whatever happens as best one can, and try to relate to what is happening as it happens. Just sharing a few thoughts there, thought it was an idea. We could find a way to move the Earth outwards, through mega-engineering. See David Brin's "Let's Lift the Earth!" Or move to another planet. Well by the time that's necessary, they are most likely to be other beings, as there is plenty of time until then for thousands of civilizations that arise and fall, new species to evolve, or indeed, for humans to evolve again all the way from the smallest most primitive multicellular creatures. For more on this, see End of All Life On Earth - A Billion Years From Now - Can It Be Avoided - And Who Will Be Here Then? But if we do survive the red giant phase of our sun - well something will happen eventually. End of the universe perhaps. Or just that parts of it become uninhabitable. Either way nothing lasts forever. But that doesn't make the universe and our Earth any less precious. Or our lives any the less worth living right now. That is, unless you buy into this idea that the only point in life is to create a legacy for the future - endlessly creating more and more future legacies - and never getting to the stage where there's an ultimate reason or point to these huge piles of past accumulating legacies from long forgotten people :). Perhaps we can learn from earlier generations of our ancestors, and other cultures that weren't so focused on this idea of creating a legacy for the future. As Shelley wrote in his "Ozymandias"
Fallen colossus of Ramesses II; Ramesseum, Luxor. Believed to be the original inspiration for Shelley's poem. What is the truth behind these stories? How likely is it that we will be hit by a huge asteroid? Why do we get stories about asteroids with a chance of hitting Earth, only to find soon after that they will miss. Can we destroy them or deflect them before they hit? What is the largest size of asteroid that could hit Earth? Could an asteroid hit us by surprise, with just a few weeks notice or a few months notice? Estimated length equivalent to 97 printed pages. Or see my Science20 blog post: Is It True That An Asteroid Will Strike Earth On [Insert Date Here]? 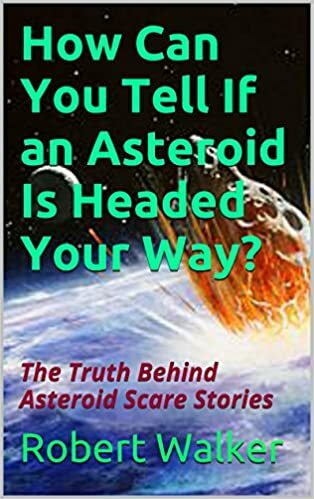 - Truth Behind Asteroid Scare Stories and several Quora answers listed on this page under Asteroid Scares and Asteroid deflection, though the book covers it in somewhat more detail.